Complete Classic. Do I really have to review this for you? It's the first of the 3 Indiana Jones movie that have been made. They're supposedly making a 4th one, but we'll see about that. This one had some of the really classic stuff in it. The fist with the crazy-sword guy where Indy just takes out his gun. "Bad Dates." "They're dates. Ya eat em!" Some geat stuff. Alfred Molina at the very beginning. I totally didn't recognize him at first. 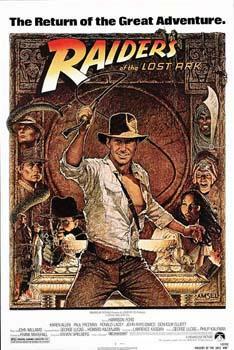 All the Indiana Jones Movies are great. Ok really though: this one is essentially about the fact that the Nazi's have found a legendary city where the lost ark was hidden that was buried after a year-long sand storm. For those of you who don't know, the Ark (or the Ark of the Covenant) is the thing the Jews used to carry the tablets that Moses had with the 10 commandments inscribed upon them. The only thing that I laugh at with this movie is the special effects at the end. Rather silly.